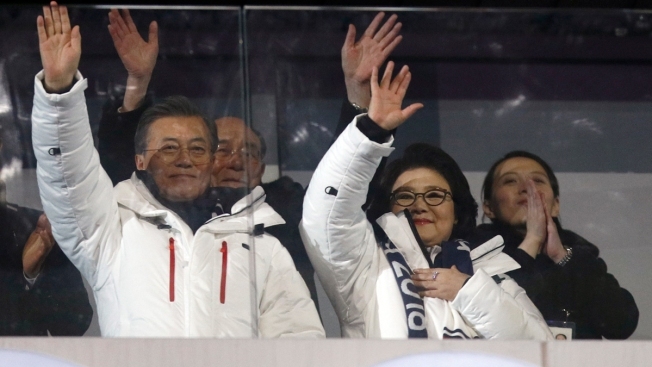 South Korean President Moon Jae-in, front left, first lady Kim Jung-sook, Kim Yong Nam, the 90-year-old president of the Presidium of the North's Parliament, second from left in the back, and Kim Jong Un's sister Kim Yo Jong, right, wave when the combined team came in during the opening ceremony of the 2018 Winter Olympics in Pyeongchang, South Korea, Friday, Feb. 9, 2018. South Korean President Moon Jae-in on Saturday met with senior North Korean officials including leader Kim Jong Un's sister over lunch at Seoul's presidential palace in the most significant diplomatic encounter between the rivals in years. The luncheon at the Blue House came after Kim Yo Jong and other North Korean delegates attended the opening ceremony of the Pyeongchang Winter Olympics, which has brought a temporary lull in tensions over the North's nuclear program. At the Olympic Stadium's VIP box, Kim Yo Jong and North Korea's nominal head of state, Kim Yong Nam, took their place among dignitaries from around the world, including U.S. Vice President Mike Pence who sat just a few feet (less than a meter) away and seemed to make an effort not to acknowledge them. South Korean television showed a smiling Moon entering a reception room and shaking hands with the North Koreans, who also included Choe Hwi, chairman of the country's National Sports Guidance Committee, and Ri Son Gwon, chairman of the North's agency that deals with inter-Korean affairs. North and South Korea held their first major joint talk in two years, with North Korea agreeing to reopen a military hotline and sending delegates to Pyeongchang for the 2018 Winter Olympics. North Korean leader Kim Jong Un made a push for renewed ties with South Korean leadership, following a year of heightened tensions from North Korea with the rest of the world over its expanding nuclear and missile programs. "You went through a lot of trouble braving the cold until late," he told them. After sitting at the table, Kim Yo Jong pulled out what appeared to be a blue document folder in front of her, which sparked the interest of the local media that speculated she might be carrying a personal message from her brother. Moon was joined by his national security director Chung Eui-yong, chief of staff Im Jong-seok, National Intelligence Service chief Suh Hoon and Unification Minister Cho Myoung-gyon. Moon is desperate to use the games as an opportunity to restore regular communication with North Korea and eventually pull it into talks over resolving the international standoff over its nuclear program. It's still unclear whether Saturday's event could be used to set up bigger meetings between the Koreas. Lawmakers from Moon's liberal ruling party have talked about the possibility of South Korea sending a special envoy to Pyongyang to meet with Kim Jong Un. There's even speculation of a summit between Kim and Moon. Moon has already put a summit offer on the table. The first liberal president in a decade, Moon during his inauguration speech last year that he would be willing to visit Pyongyang and meet with Kim Jong Un if that helps solve the nuclear problem. 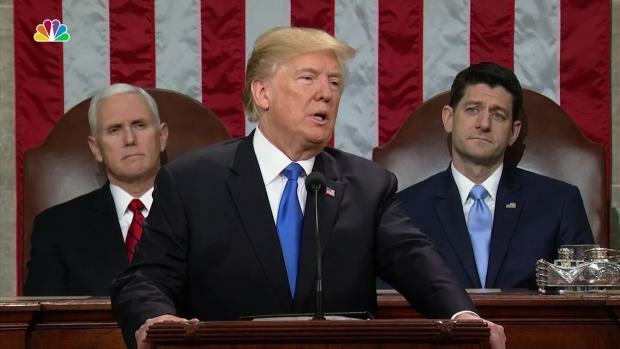 President Trump spoke of the dangers of North Korea's nuclear missile program, and told the story of a North Korean defector, during his State of the Union speech. The North and South held summits in Pyongyang in 2000 and 2007, both hosted by late Kim Jong Il, the father of Kim Jong Un. Kim Yo Jong, 30, is the first member of North Korea's ruling family to visit the South since the end of the 1950-53 Korean War. Analysts say the North's decision to send her to the Olympics shows eagerness to break out from diplomatic isolation by improving relations with the South, which it could use as a bridge for approaching the United States. Saturday's meeting was the first time a South Korean president hosted North Korean officials for a luncheon at the Blue House since November 2007, when late liberal President Roh Moo-hyun, the political mentor of Moon, invited then-North Korean premier Kim Yong Il following a meeting with government officials in Seoul. However, no member of North Korea's ruling family has ever before visited the Blue House, which is near where North Korea founder Kim Il Sung — Kim Yo Jong's grandfather — sent dozens of commandos to assassinate former South Korean military strongman Park Chung-hee in 1968. They were stopped and most were killed near the palace, which was newly rebuilt in 1991. Moon and Kim Yo Jong broke out broad smiles as they shook hands ahead before the start of the opening ceremony at Pyeongchang's Olympic Stadium. Moon had earlier met Kim Yong Nam during a dinner he hosted for visiting dignitaries. Moon and the two North Korean delegates cheerfully clapped and waved as the athletes from the two Koreas jointly marched during the ceremony holding a blue-and-white flag symbolizing a unified Korean Peninsula. Pence and Japanese Prime Minister Shinzo Abe sat nearby, looking expressionless. As if to drive the point home, Kim Jong Un used the eve of the Olympics to throw a massive military parade in Pyongyang that was highlighted by several huge intercontinental ballistic missiles rolled out in launcher trucks. Analysts say that the missiles, which were successfully flight tested three times last year, could potentially reach deep into the U.S. mainland when perfected. The North also last year conducted its sixth and most powerful nuclear test to date. In a meeting hours before Friday's opening ceremony, Abe warned Moon not to fall for North Korea's "smile diplomacy" during the Olympics, according to Moon's office. Pence carried a similar message during his trip to Japan and South Korea. Abe discussed North Korea's nuclear and missile programs and brought up the issue of Japanese nationals who were abducted by the North decades ago when he shook hands and briefly spoke with Kim Yong Nam during the dinner hosted by Moon in Pyeongchang, the Kyodo News service quoted the Japanese government as saying. After the opening ceremony, the North Korean delegates moved to Seoul and spent the night at the Walkerhill hotel, a riverside facility named after late U.S. Army commander Walton Walker, who's considered a Korean War hero in the South. It was built in the 1960s as a luxury facility for U.S. troops stationed in the South. The North Korean delegates later Saturday may attend the debut of the first-ever inter-Korean Olympic team at the women's ice hockey tournament in Gangneung. They may also see a performance by a visiting North Korean art troupe in Seoul on Sunday before flying back to Pyongyang. The North has sent nearly 500 people to the Pyeongchang Games, including officials, athletes, artists and also a 230-member state-trained cheering group after the Koreas agreed to a series of conciliatory gestures for the games.